1. The service is provided only to request repeat prescriptions. 2. You can order items listed on the repeat request form attached to your last prescription. 3. If the date for your next review with a doctor has passed you may be asked to make an appointment before they will issue a repeat prescription. 4. Your prescription will be delivered approximately three working days after your request has been submitted. 5. An email confirming your repeat request will be sent to the address you provide on the form on the following page. I confirm that I have read and accepted the terms and conditions above. Getting started is simple, you just need to tell us the details of the items that you would like to order from your NHS prescription, and give us some simple registration details. We will then request your prescription from your GP. 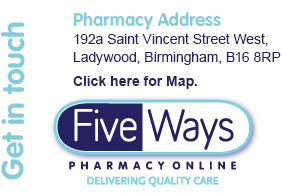 Once we have obtained your prescription we will dispense and deliver it directly to you for FREE. NHS Prescription charges are standard at £8.60 per item unless you are exempt from payment.